Amanda Conner's amazing artwork showcasing some of DC's most iconic female characters is collected together for the first time in the large, deluxe-format GIRL POWER: AMANDA CONNER GALLERY EDITION. Sourced from the original art, this collection reflects the incredible diversity and power of Conner's style. 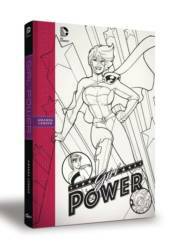 Contained between the oversized covers of this Smythe-sewn edition are high-resolution scans of Amanda's art boards for POWER GIRL #1, 7, 8 and 9, DC'S WEDNESDAY COMICS Supergirl feature and the complete BEFORE WATCHMAN: SILK SPECTRE saga, as well as an assortment of cover art from these series. Graphitti Designs' Gallery Editions strive to replicate the look, feel and attitude of the artwork. Every page is reproduced at original size on heavy paper stock to provide the fan and collector with museum-quality reproductions that are unobtainable from any other source. See for yourself why Conner's fan-favorite work continues to grow in popularity with this larger-than-life presentation! Measuring 12' by 17', this deluxe Smythe-sewn volume features Conner's work printed in high definition at 200 lines per inch on heavy paper stock to closely approximate the look and feel of the original art boards.